Experience 15 nights / 16 days of adventurous journeys around the island as you create unforgettable memories on our trekking tours in Sri Lanka; enjoy a trek through ancient cities and explore the historic and mysterious cave temples of Dambulla, make the ascent up the Sigiriya fortress, hike through a World Heritage Site, and pay a visit to an elephant orphanage. An exciting and detailed tour package for tourist groups, student groups and families interested in an adventurous journey awaits. On arrival at the Bandaranaike International Airport, you will get your first taste of warm Sri Lankan hospitality; Representative from Nkar Travel House will welcome you and transfer to Colombo. Colombo, like many capital cities in developing countries is fast changing its face. Almost overnight, skyscrapers arise from where old buildings once stood. Yet in some parts, the old world charm is retained. For example, there is a 100-year-old clock tower and several British built colonial buildings. Other places of interest are the Pettah bazaar – where one can shop for bargain, a Hindu and a Buddhist temple, residential areas where you find the stately homes of the affluent, the Bandaranaike Memorial International Conference Hall (BMICH) – an outright gift to Sri Lanka from the People’s Republic of China. Check-in to the hotel and relax. Overnight stay at hotel in Colombo. Breakfast at the hotel and transfer to Anuradhapura. In the evening visit Mihinthale. Mihintale is where Buddhism was first introduced to Sri Lanka. Mihintale is regarded as the cradle of Buddhism in Sri Lanka. The rock is riddled with shrines and rock dwellings. A grand stairway of 1,840 steps made out of granite slabs 15” wide leads to the summit from where one could get a splendid view of the surrounding countryside. Overnight stay at hotel in Anuradhapura. Breakfast at the hotel and transfer to visit Anuradhapura. Visit Anuradhapura. It was the first capital and undoubtedly the grandest city of the ancient Sri Lanka. It is the home of two World Heritage sites. Many places of historical and archaeological interest could be visited. Sri Maha Bodhi (Sacred Bo-Tree) was brought as a sapling of the tree under which Prince Siddhartha attained to enlightenment and it is over 2,200 years old and is the oldest historically documented tree in the world. At Brazen Palace (2nd century B.C), the 1600 stone columns you see are all that is left of a magnificent multi-storied residence for monks. Ruwanweliseya (2nd century B.C) is the most famous of all the Dagobas. It originally depicted the perfect ‘bubble shape” that modern restoration has not been able to accurately reproduce. ‘Samadhi’ Buddha statue (4th century AD) is one of the most famous statues, depicting the Buddha in a state of ‘Samadhi’ or deep meditation. Isurumuniya rock temple (3rd century B.C) is well known for its rock carvings. Proceed to Dambulla and in the evening visit Dambulla Rock Temple. Dambulla rock temple has been built by king Walagambahu in the 1st century B.C. and it is a world heritage site. Also, it is the most impressive of Sri Lanka’s cave temples. The complex of five caves with over 2000 sq. metres of painted walls and ceilings is the largest area of paintings found in the world. It contains over 150 images of the Buddha of which the largest is the colossal figure of the Buddha carved out of rock and spanning 14 metres. Overnight stay at hotel in Dambulla. Breakfast at the hotel and transfer to Habarana. Start the Hiriwaduna trek. Trek will be through the archetypal Sri Lankan village. The trek begins transferring the clients in Land Masters. You can see the amazing birdlife, butterflies and possible sightings of crocodile only add to the charm of the trek. If you are luck you can sight the villagers as they go about their morning tasks of fishing or washing clothes at the periphery of the lake. Initially one wades through a shallow stream and thereafter crosses a wider tributary in a catamaran of an obliging farmer to inspect cultivation. You can enjoy a catamaran ride, a bullock cart ride and finally a tasty Sri Lankan meal made at home by the villagers. There after visit Polonnaruwa and explore the site in Bicycles. Polonnaruwa, which was the 2nd capital city of Sri Lanka built in the 11th and 12th centuries AD, and which is a world heritage site. Here you can see the ruins of the Royal Palace, the Gal Viharaya where 4 splendid statues of the Buddha in ‘Upright’, ‘Sedentary’ and ‘Recumbent’ postures carved out of rock could be seen, the Audience Hall, the Lotus Bath, the statue of king Parakramabahu, and the Parakrama Samudraya – a lake built by King Parakramabahu the great. There are also monuments of famous places of worship such as the Shiva Temple, the Lankathilake, the Watadage, the Galpotha, the Kiri Vehera and the remains of a former Temple of the Tooth Relic. On your way back to hotel you could also witness a wood carving shop where you will be shown all the types of timber and hardwood available in Sri Lanka and all the creative furniture made by our master craftsmen. Breakfast at the hotel and transfer to visit Sigiriya. Climb the 5th century Sigiriya rock fortress which is a world heritage site, built by King Kashyapa (477-495 AD). The ‘Lion Rock’ is a citadel of unusual beauty rising 200 metres from the scrub jungle. The rock was the innermost stronghold of the 70 hectare fortified town. A moat, rampart, and extensive gardens including the renowned water gardens ring the base of the rock. Visit the world-renowned frescoes of the ‘Heavenly Maidens’ of Sigiriya, which are in a sheltered pocket of the rock approached by a spiral stairway. These frescoes are painted in earth pigments on plaster. Transfer to Matale and check in to the bungalow and relax. Overnight stay at a Bungalow in Matale. Breakfast at hotel and start the Half day Knuckles Trekk. The Knuckles Mountain Range (So-called because its appearance resembles a set of knuckles in a closed fist) is a major eco tourism venue of Sri Lanka and has been declared a conservation area, now known as the KNUCKLES NATIONAL HERITAGE AND WILDERNESS AREA. 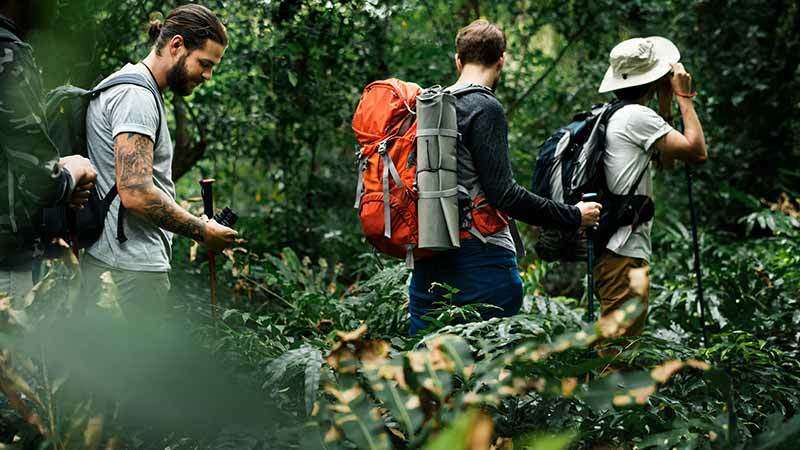 The region stretches an impressive 155 sq km that contains five major forest formations, a wide variety of rare and endemic flora and fauna and some breathtaking mountain scenery of Sri Lanka. It is a real paradise for those who love to hike or mountain Bick, offering numerous mountainous trails that journey across clear rivers, through dense forests, past flowing waterfalls and lush tea plantations, and alongside terraced paddy fields and colorful Kandyan home gardens. Proceed back to hotel and relax. Breakfast at hotel and transfer to Kandy. Enroute visit a Spice garden in Matale. There after do city tour in Kandy. Kandy was the last capital of the Sri Lankan kings which is a World Heritage Site. The name “Kandy” conjures visions of splendor and magnificence. Many of the legends, traditions and folklore are still lovingly kept alive. Drive around the Kandy Lake built by the last Sinhala king Sri Wickrama Rajasinghe in 1798. Visit Bazaar area, Arts & crafts centre, a Gem museum and a lapidary etc. In the evening visit Temple of the Tooth Relic. Late evening witness the Cultural Show. Breakfast at the hotel and transfer to visit Pinnawela Elephant orphanage. The Pinnawela Elephant Orphanage, established in 1975, commenced with seven orphans. Today some of these orphans enjoy the fortune of seeing their grandchildren born in the same location. The original objective of establishing the orphanage inclined more towards tourism, but is soon became a conservation and educational centre. With the help of local and foreign elephant experts, Pinnawela started a scientific captive-breeding programme for elephants. The free movement of the herd enhanced the chances for respective individuals of both sexes to get together and mate. The nearby river played a dominant role in this regard, and in 1984, the first baby of Pinnawela was born. The success story of Pinnawela has drawn the attention of scientists from all over the world. A considerable number of books and research articles on Pinnawela have been published in several languages. The members of the Pinnawela herd have been filmed, videoed and photographed thousands of times by professionals. There after visit Peradeniya Botanical Gardens. This botanical garden was first built as a pleasure garden by a Sinhala king and was expanded by the British. It is 147 acres in extent and provides an amazing variety of trees, plants and flowers. Overnight stay at hotel in Kandy. Breakfast at the hotel and transfer to Nuwara Eliya. Nuwara Eliya, because of its invigorating mountain climate and scenery, is Sri Lanka s most popular hill resort. Nuwara Eliya is also the heart of Sri Lanka s tea country producing a significant share of the world best tea. Sri Lanka s highest mountain Pidurutalagala (8282 feet) is located here. Nuwara-Eliya also has one of the finest 18 hole golf courses in South Asia. Overnight stay at hotel in Nuwara Eliya. Breakfast at the hotel and transfer to Horton Plains. Visit Horton Plains (Trekk – Approximately 03 ½ Hrs). The Horton Plain Plateau is a secluded wilderness sanctuary 2130 m high and offers one of Sri Lanka’s most unforgettable views. Here the land plunges down a dizzy gorge to the southern foot hills and on clear days, even a glimpse of the sea more than 80 km away is possible. The Horton Plains are the habitat of giant Rhododendron (an evergreen shrub with large clusters of trumpet shaped flowers), tree fern primrose and daffodil orchids and birds such as the Sri Lanka Whistling Thrush and Arrenga, the Shaggy Bear monkey and the blue mormon butterfly and many other endemic and endangered montane species. Breakfast at the hotel and transfer to Maskeliya. 12 Mid night Start to climb Adams Peak. Adams Peak is known locally as Sri Pada and is Sri Lanka’s fourth highest mountain at 2,243 metres. It is one of the island’s most important pilgrimage sites and is situated in the Ratnapura district. The giant footprint at the top is the attraction and is sacred to Buddhists, Hindus and Muslims. The conical shaped mountain is worth the climb for the views and spiritual experience regardless of your belief. Overnight stay at hotel in Maskeliya. Climb down from Adams peak and rest at hotel. There after transfer to Sinharaja. The Kelani River (the broadest river in Sri Lanka) flowing through Kitulgala was the main location where the Oscar winning movie “Bridge on the River Kwai” was filmed. On the hill above this town, a prehistoric cave was recently discovered containing large middens of shells from some unknown civilization. Overnight stay at hotel in Sinharaja. Breakfast at hotel and transfer to Sinharaja. Do a trekking at Sinharaja Rain Forest. This is Sri Lanka’s only remaining primeval rain forest. A single foot path cuts through the heart of its 50 sq. miles. The vegetation is many layered as in the Amazon or Congo. Rare orchids blossom and cicadas chirp. The only other sound is that of rain: 200 inches fall annually here, spread through the year. There after transfer to beach stay. Overnight stay at hotel in Down south beach area. Breakfast at hotel and day spent at leisure. Breakfast at hotel and transfer to Airport for the departure flight. © 2019 NKAR Travels All rights reserved.